Circuits, Weight Classes, and… Mexico? Well I introduced the ladies in my Saturday morning class to circuit training today! We started off with just a three minute circuit with three minutes to recover in between – we will eventually work it up to a five minute circuit with a minute rest in between. Today we drilled loop chokes from half guard. Our position this week has been guard, but one of my ladies has sore ribs and a bum wrist – so we worked around it! 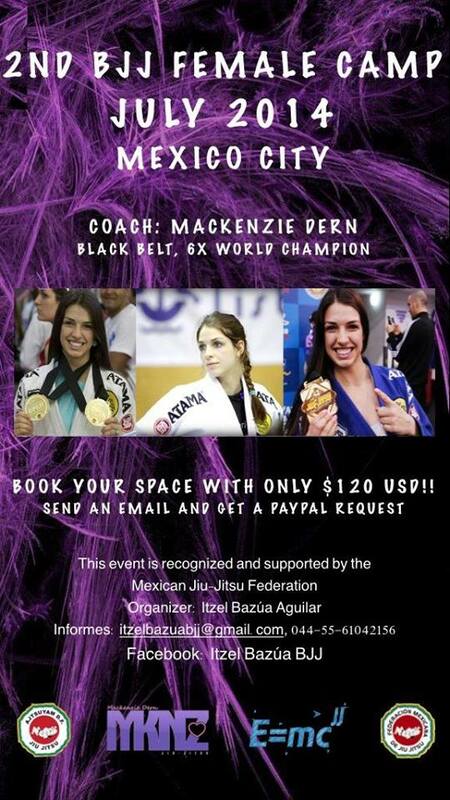 I just registered for a training camp in Mexico City with Mackenzie Dern and Sophia Drysdale. It will be at the end of July, and I am EXTREMELY excited for it already! Get your registration in now to reserve a spot! In other news, I talked with my coach yesterday about my weight cut. He decided he wants me to stick with light weight instead of continuing my drop to feather weight. Not gonna lie, I’m kind of happy about that! Size wise, I fit in the feather division better. Problem being, my doc says I have very dense muscle, so I weigh a lot more than I look. I’d have to lose a substantial amount of muscle to make featherweight, and that isn’t safe for me because of my hypermobility. Meaning: I’m currently 132, so coach wants me back up to 137-138. I’m not just gonna fluff up though. I’m sticking with eating really clean, upping my caloric intake, and adding more strength training into my routine. I will confess, I’m going out for Italian food tomorrow for dinner with friends – but i’ll burn through that in no time flat! See what Tournaments I’ll be at next! I love to meet people!